Did you know the Home Server Console uses the Remote Desktop Protocol/Terminal Services to bring the application to clients? 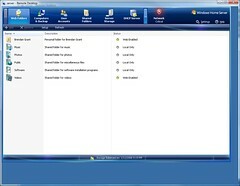 Did you know that you can launch additional applications in the session? 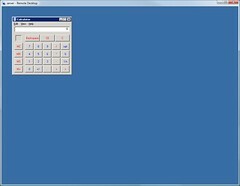 Windows Terminal Services is a server component dating back to NT4 which allows remote machines to connect to a server and be presented with a (nearly) fully functional desktop where a user can do their work almost as fast and easily as if it was local without having to having access to anything more than a client app (available as either a desktop app or ActiveX control) and a network connection. We saw this same technology brought to Windows XP for it's Remote Desktop feature and now in Windows Home Server for both normal Console use as well as more complicated administration. Provide credentials and click the OK button. This is the simple way to connect and with default options. The client and protocol have many more options than we normally use. 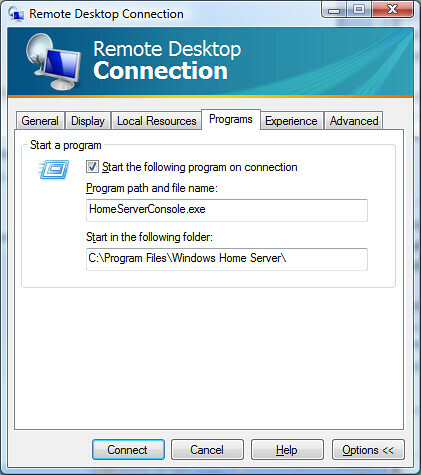 Check "Start the following program on connection"
That's right... the WHSConsoleClient application on WHS client PC's is largely just a fancy Terminal Services client that executes "homeserverconsole.exe -b" on the server on connect as well as provides the plumbing to make IConsoleServices.OpenHelp() and IConsoleServices.OpenUrl() calls be passed back to and launched on the client. With this in mind we have a number of possibilities. Before going any further I want to make clear that what I will be describing below is completely unsupported by me and by Microsoft and can result in loss of key files. This information is provided for informational purposes only and for those who wish to do some hacking of their own server. Nothing in this post should be used as part of any add-in or other software on Home Server's that are not owned by reader of this post and author of said add-in or software. The simple method is simply to rename (and backup) HomeServerConsole.exe on the server and put in it's place an application of our choice or design that can handle being used in the strange window size used by the Home Server Console. It's interesting to note that HomeServerConsole.exe like a good number of the Home Server files are not protected by Windows File Protection, nor is there any other security mechanism in place to prevent a malicious user from replacing HomeServerConsole.exe with their own application. So what should we replace it with? 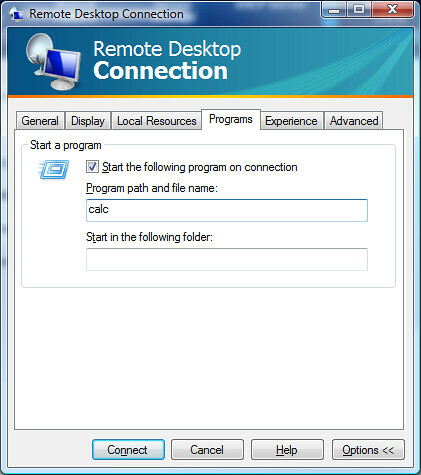 I find myself often using the Remote Access web site to connect to my main desktop PC and sometimes need to do something on my Home Server... which requires launching one Remote Desktop connection inside of another one. While this works... it's certainly not ideal. Instead what if we were to launch Windows Explorer in the same Terminal Services session that we have the Home Server Console in? //Launch the Home Server Console anyway. In the above code, I use some methods from the Terminal Services API to determine if the session our app is running in was asked to launch the Home Server Console, if so we'll launch the real thing (named HomeServerConsole1.exe in this example) as well as a copy of Explorer... otherwise we'll just launch the Home Server Console. The actual check for to determine the startup application involves a call to WTSQuerySessionInformation() with the WTS_CONFIG_CLASS.WTSUserConfigInitialProgram enumerated value. Note the above code is remarkably slow on my WHS when it comes to launching the Home Server Console... resulting in a load time of several minutes, something I have not spent much time debugging as yet. With a little additional work, we could enumerate the currently running processes (with WTSEnumerateProcesses() ) and determine if an instance of explorer is already running, and if not launch one. 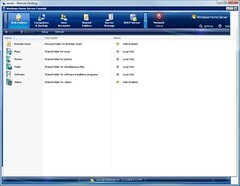 Likely this method will only work so long as there is no protection of the WHS files, although should that not change this option will be even more powerful should the next version of Windows Home Server be based on Windows Server 2008 and use TS RemoteApp for displaying of the Home Server Console. No sample this week as this post is intended to be more theoretical and informational rather than practical. Hopefully this has given you some ideas of how you could use this on your own. 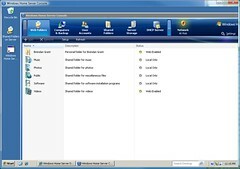 With a little use of the Terminal Services API and a bit of file renaming it is possible to execute ones own custom code prior to the Home Server Console being launched, giving numerous options for additional customization of the Windows session that the Console is loaded in... be it launching Windows Explorer, other applications or applying custom external settings to the Home Server Console. Hacking the Home Server Console (in place) using reflection. As always though, I'd love to hear your ideas of what you'd like to see in future.